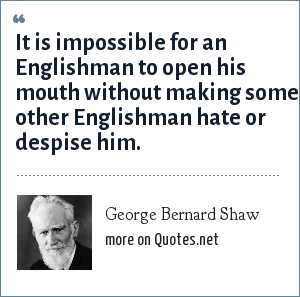 George Bernard Shaw: It is impossible for an Englishman to open his mouth without making some other Englishman hate or despise him. "George Bernard Shaw Quotes." Quotes.net. STANDS4 LLC, 2019. Web. 23 Apr. 2019. <https://www.quotes.net/quote/480>.